Movement: The vocal cord opens normally for breathing and closes normally for voicing. Position and appearance: Position is normal. Typically, the margin of the cord is slightly concave, the ventricle is capacious, and the conus area below the free margin is lacking in bulk. Appearance during voicing (under strobe lighting): Closure at the posterior commissure is complete and symmetrical bilaterally. Under strobe light, one sees flaccidity as indicated by increased amplitude of vibration; the lateral excursions become exaggerated and the mucosal wave increases. One may also see chaotic fluttering. Voice quality: Weak and air-wasting and often indistinguishable from a case of complete vocal cord paralysis—TA, LCA (lateral cricoarytenoid), and PCA (posterior cricoarytenoid). Other variants of vocal cord paresis include LCA-only, TA + LCA, PCA-only, and IA-only (interarytenoid muscle). TA weakness indicated by bowed margin and “spaghetti-linguini” difference between the cords. Medial turning of vocal process (arrow) suggests intact LCA; abducted position suggests intact PCA function. Blood is from cricothyroid membrane puncture to instill topical anesthesia. Before voice gel injection at prephonatory instant. Wasting of left cord (right of photo), and capacious ventricle on the left (right of photo) clearly evident. 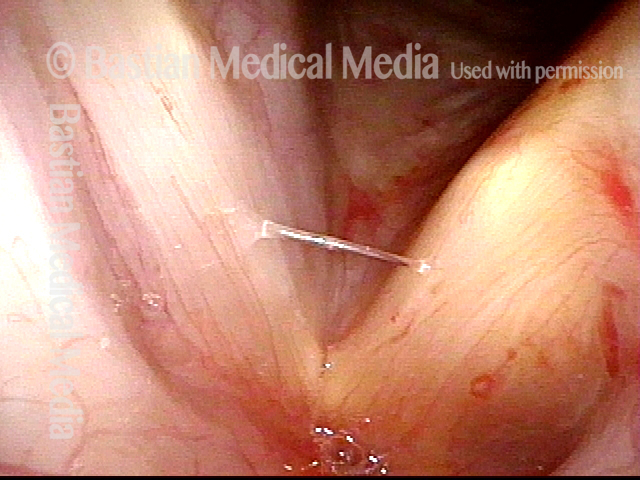 At beginning of voice gel injection (needle at white arrow). At conclusion of voice gel, note straight left cord margin (right of photo). Compare with photos 1 and 3. Phonation after injection complete. Voice dramatically strengthened. Compare with photo 2. As the cords approach voice-making position, in a man with weak voice symptoms. What details do you see? 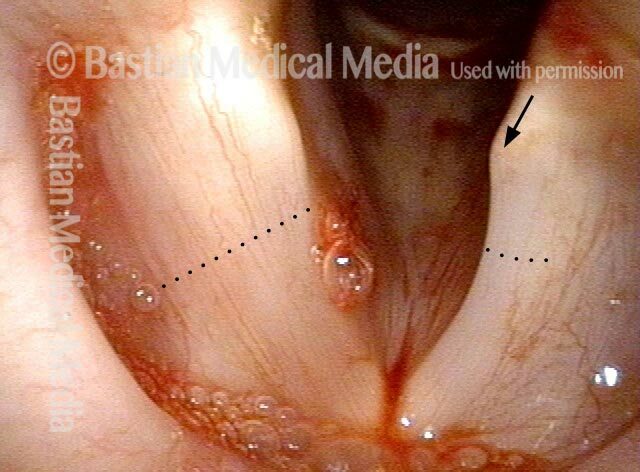 Now closed for phonation, the right vocal cord margin (left of photo) is bowed as compared with the left (right of photo), more normal cord. At closer range, not only bowing, but also absence of the "conus" bulge ("C") below the right cord (left of photo), indicates TA atrophy in a second way. Under strobe light, at the open phase of vibration, the bowed margin of the right cord is seen even more clearly. Its greater lateral vibratory excursion adds flaccidity to previously-noted bowing and atrophy. After an upper respiratory infection, this man's voice was self-rated at "45%" of normal strength. After 3 weeks, it suddenly increased to "65%," and then very slowly improved over the next 5 months to "85%" at the time of this examination. Note subtle atrophy of the left fold (right of photo). One finding of subtle TA atrophy is the smaller "conus" bulge on the left (right of photo). Compare the brackets on the two sides. Complete abduction suggests PCA function is intact. As the vocal cords are coming to midline for phonation, the bowed left vocal cord margin, indicating TA atrophy, is accentuated. Left vocal process is turning medially, suggesting preserved LCA function. An extremely subtle finding of flaccidity is the incomplete closure of the left anterior cord during the closed phase of vibration under strobe light. A highly speculative interpretation? Perhaps a complete left vocal paralysis, with early recovery of left LCA and some TA. Then more gradual recovery to this subtle TA-only paresis. Mediastinal lymphoma has just been discovered as the cause of this middle-aged man’s marked vocal weakness. He describes it as “50%” of normal. Note bowing of the right cord (left of photo) and atrophy (“spaghetti-linguini larynx”). Under strobe light, showing dramatic flaccidity and increased lateral excursion of vibration of the right cord (left of photo) as compared with the left (right of photo). Vocal processes are fairly symmetrical suggesting LCA is at least mostly intact. After several cycles of chemotherapy, the patient feels well and voice had recovered to “100%” but is at this moment only “75%” due to an upper respiratory infection (see pinkness). Note as well that the right vocal cord (left of photo) has recovered much of its bulk, bowing is reduced, and the “spaghetti-linguini” appearance is virtually gone. Under strobe light, the amplitude of vibration is equalized between the two sides and it almost looks like the lateral excursion is greater on the left (originally normal) vocal cord. This person noted abrupt and severe voice change about six months earlier. Examination elsewhere at that time showed a “paralyzed left vocal cord.” The patient remembers seeing that one vocal cord did not move at all suggesting that perhaps TA + LCA + PCA were initially paralyzed. Voice is partially recovered by the time of this examination, but still moderately weak. Note that PCA muscles are working bilaterally. Left TA (right of photo) is clearly atrophied (spaghetti – linguini comparison), margin bowing, etc. We can’t yet decide about LCA function. As the vocal cords approach each other just before phonation, the vocal processes turn medially on both sides, though perhaps a little better on the right than the left. Now we know that LCA muscles are both working. At the pre-phonatory instant, just before vibratory blurring, the normal right cord (left of photo) has a straight margin, while the left (right of photo) is bowed (TA is deficient). Both vocal processes are in a line—NOT pointing laterally on the left as would be the case if the LCA were not working. We see again that the only muscle not working is the left TA. Here, under strobe light, at open phase of vibration, note that the lateral amplitude of the left vocal cord (right of photo) is greater, due to flaccidity of the atrophied left TA muscle.